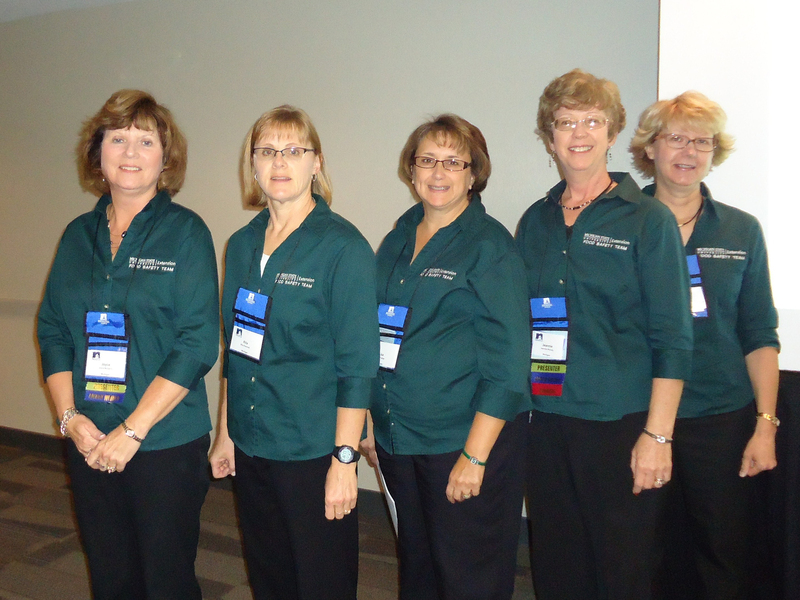 Michigan State University Extension staff members won several awards at the National Extension Association of Family and Consumer Sciences (NEAFCS) national conference in Columbus, Ohio, Sept 27. The Michigan Extension Association of Family and Consumer Sciences (MEAFCS) will recognize the educators at the membership meeting at Fall Extension Conference. The Health and Nutrition Institute Food Safety Team was first place national winner and first place Central Region winner for Food Safety. The award recognizes outstanding educational programs conducted for families, school nutrition workers, food industry employees or managers, church workers preparing meals, home care providers, and other groups or individuals preparing or serving food. The MSU Extension Food Safety Team received first place national winner award and first place Central Region winner for Food Safety at the NEAFCS national conference Sept. 27, 2012, in Columbus, Ohio. 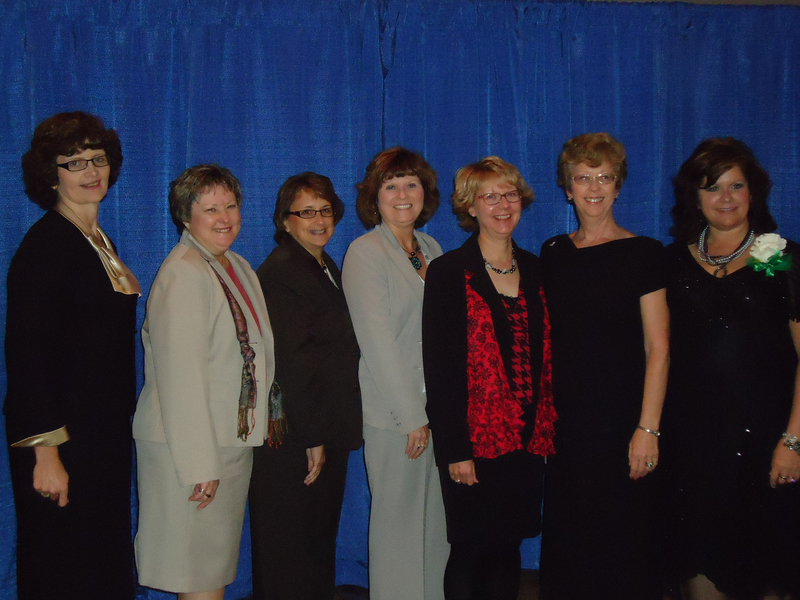 Pictured left to right: Associate Dean of UNL Extension Kathleen Lodl, MSU Extension staff members Eileen Haraminac, Lisa Treiber, Joyce McGarry, Beth Waitrovich and Jeannie Nichols and NEAFCS President Amy Peterson [not present Christine Venema, Pat Joyce (retired), Jan Seitz (retired)]. Evaluated on program objectives, program accomplishments, program impact and support materials, the team received a score of 98 out of a possible 100. Jeannie Nichols led the team that includes Eileen Haraminac, Pat Joyce (retired), Joyce McGarry, Janet Rathke, Jan Seitz (retired), Lisa Treiber, Chris Venema and Beth Waitrovich. The team applied for and received a Michigan Department of Agriculture and Rural Development grant allowing them to provide statewide programming in 2011. They taught face-to-face workshops around the state and developed an online training at msue.anr.msu.edu/programs/cottage_food_law. The workshops and online training taught Michigan residents about the new 2012 Cottage Food Law and the importance of food safety practices when preparing and selling cottage foods in Michigan. Teresa Clark-Jones led the Financial and Home Ownership Education Team, made up of mostly Greening Michigan Institute members, that took third place in the Central Region for Communications – Internet Education Technology. The award recognizes excellence in Web-based programs or Web pages. In addition to Teresa, team members include Connie Costner Borg, Dr. Lisa Cook, Kathy Hale, Jean Lakin, Wanda Repke and Erica Tobe. The team created www.mimoneyhealth.org with education information related to financial literacy for the public to access. On the website, consumers can take the Financial Health Survey, in which each survey participant determines his or her financial health index score and receives resources to help increase the score. Extension educator Carolyn Penniman won a Distinguished Service Award. The Distinguished Service Award is the highest award presented by the NEAFCS. The award recognizes members for leadership, outstanding program efforts and personal and professional development. Carolyn has been part of MSU Extension for more than 14 years, providing education in parenting education, food safety, training for foster and adoptive parents, and financial literacy. She’s participated in international Extension training and led the Poverty Reduction Initiative for Charlevoix and Emmet counties. She used a United Way grant to provide two poverty simulation workshops and develop a Money Mentor program. Besides winning awards, MSU Extension staff members were busy presenting sessions at the conference, lending their expertise to their colleagues. Health and Nutrition Institute Extension educator Suzanne Pishpresented a session at the conference from RELAX: Alternatives to Anger, an anger management program for young people, parents and caregivers. MSU Extension staff members presented on the Cottage Food Law at the NEAFCS national conference Sept. 27, 2012, in Columbus, Ohio. Pictured left to right: MSU Extension staff members Joyce McGarry, Rita Klavinski, Lisa Treiber, Jeannie Nichols and Beth Waitrovich. Photo credit: Eileen Haraminac. In addition, Extension educators Joyce McGarry, Jeannie Nichols, Lisa Treiber and Beth Waitrovich of the Food Safety Team presented a session on the Cottage Food Law. Extension educator Rita Klavinski provided technology support at the conference. Congratulations and thanks to all of our award winners and session presenters! Michigan’s Cottage Food Law, enacted in 2010, allows individuals to manufacture and store certain types of foods in an unlicensed home kitchen. It’s intended to support farmers markets by allowing certain value-added products to be sold without the expense and trouble of preparing them in a licensed commercial kitchen. The Michigan State University Extension Food Safety Team made a teaching webinar in order to meet the needs of Michigan residents in relationship to food safety pertaining to the Cottage Food Law. The webinar was the most efficient and consistent way of providing educational information to this audience. Led by food safety co-chairs and Extension educators Jeannie Nichols and Jan Seitz, the Food Safety team members include Jennifer Berkey, Robin Danto, Diana Fair, Eileen Haraminac, Jane Hart, Linda Huyck, Pat Joyce, Joyce McGarry, Laurie Messing, Lucia Patritto, Janet Rathke, Christy Rivette, Phil Tocco, Lisa Treiber, Chris Venema and Beth Waitrovich. The team developed “MI Cottage Food Law Food Safety Training/Webinar” with support from Agriculture and Natural Resources Communications team members Laura Probyn, Steve Evans and Kraig Ehm. Laura edited and revised the initial script. Laura and Kraig voiced the project, and Steve edited the PowerPoint that was the basis for the webinar and built quiz and evaluation modules for the project. According to Jeannie, the quiz at the end of the webinar evaluates the knowledge that participants gain as well as their intent to use the information from the webinar. Once a participant completes the quiz with 70 percent accuracy, he or she can purchase a certificate to display at a farmers market booth. Farmers markets customers would then see that the vendor had taken the initiative to take some extra food safety training in relation to cottage foods. Food Safety Team members conducted face-to-face presentations throughout the state using the curriculum to validate its content and usefulness before it was made available online. To help with this project, the team applied for and received a Michigan Department of Agriculture and Rural Development (MDARD) grant that allowed the production of this webinar including marketing materials. Plans are underway to add the webinar to the governor’s weekly video feature rotation and to be placed on the MDARD’s YouTube channel. This is a great illustration of what the new MSUE is all about and how we’re embracing technology to achieve our mission. And it shows the interlinkage among work teams and institutes. Some of the greatest demand for the webinar is likely to come from individuals and businesses who sell homemade products at farmers markets, which are among the assets that we try to support through the community food systems group in the Greening Michigan Institute.